In today’s Brazil, everything is as it seems. The belly of politics has been turned inside out, its ghastly lining exposed, weeping fetid and corrosive juices into society’s sickly bloodstream. Conspiracy is a palpable practice, not a theory. Social and news media are primary battlegrounds. Stealth loses its currency, and political advantage is determined by speed of action. Adversaries from multiple factions race to pre-empt each other’s offensives, which seem to outpace and splinter time’s arrow. The present shrinks. Tomorrow is here. Plutarch’s ‘man of today’ is already dead. Hindsight is selective; it rationalises and sequences past events, ascribing to them a logic they rarely manifest in the moment. But mere reflection on the complexity of Brazilian politics in recent years discredits any linear narrative. Each mazy sub-plot forms part of history’s infinite labyrinth. Contingency and absurdity are more accurate descriptors than ‘order and progress’. And yet, hiatuses between frenzied accusation and counter-accusation are filled with talk of modernisation – as justification for the current government’s agenda or as proposed correction to it – reflecting the materialism and rationalism that have guided the aberrant construction of the Brazilian republic. In 1941, in a credulous modernist paean, Austrian writer Stefan Zweig declared that Brazil was the ‘country of the future’. The positivist founders of the republic had already sought to direct popular imagination towards the future: a national destiny, a responsibility, but also a pacifying distraction. During the ‘Old Republic’, however, modernity was little more than a technocratic ideal, or a rhetorical device, deployed by oligarchs, generals, and public administrators to protect their respective political interests. It was Getulio Vargas who transformed modernity into a strategic national project, with developmental objectives that would be pursued until the political and economic liberalisation of the 1980s. The nationalist currents of this project faded quickly under democracy, but its conception of history has remained hegemonic, informing the prescriptions of liberals and Marxists, Friedmanites and Keynesians: linear and ineluctably progressive, history is thrust forth by the dynamic processes of capitalist development, with the state as rational planner and overseer, external to economic activity. Challenges to this have been functional not structural, ontic not ontological. (While the neoliberal reforms of the 1990s altered the nature of the state’s interventions in the economy, they did not reconceive its historical role in development; that Brazil’s neoliberal state was constructed so rapidly is due in large part to the institutional capacity of the developmentalist state that it replaced). Brasília is in moral collapse. Meanwhile, Michel Temer blithely speaks of modernisation, appealing to Brazil’s residual oligarchy and a cabal of inveterate political elites. During the first month of his interim presidency, in May 2016, Temer adopted the nation’s founding slogan, ‘order and progress’, as the slogan for his government. Reaching back, he nonetheless has projected forward, grounding in tradition the promise of a steady advance towards the future. ‘Order and progress always walk together’, he has said. Temer has thrown the weight of the executive behind a comprehensive revamp of Brazil’s welfare and labour regimes. He has pushed through constitutional amendments to cap social expenditure for twenty years, open the labour market to unrestricted tertiarisation, and ‘simplify’ labour laws. And he is rallying congress to approve an improbable overhaul of social security. While these reforms are presented as ‘a bridge to the future’, they closely resemble, if not identically replicate, constitutional amendments attempted during the presidency of Fernando Henrique Cardoso. They have the flavour of reforms of that era’s starry-eyed neoliberals, and appear especially anachronistic when set against the self-doubt and even compunction expressed relatively recently by the IMF – flag-bearer for economic orthodoxy – in reference to its previous promotion of neoliberal strategies. Temer’s efforts to reform government are aimed at demonstrating his worth to political associates and business leaders who might determine his political, and even legal, fate. Continuous reform also generates noise that distracts from the various measures he has taken to protect himself and allies, who, like him, face corruption charges. For this reason, the more controversial reforms are from a social perspective, the more useful they are. In the meantime, mounting protest is contained with increasingly militarised and truculent repression, justified in Brazilian news media by hysterical coverage of ‘provocation’ and ‘vandalism’. In practice, then, Temer’s modernising activity has been simultaneously a form of retrospection and a fuite en avant. And yet the outcome – the modernity he has sought – is the reinforcement of the status quo: he has tried to ‘simplify’ and deregulate Brazil’s incipient welfare state, increasing the precariousness of low wage labour and the opportunity for capital accumulation; and, with growing flagrance, he has found new ways of granting legal immunity to his inner circle, further institutionalising political corruption and subterfuge. Brazil’s ‘new right’ – represented by João Doria, the current mayor of São Paulo and a possible presidential candidate in 2018 – also speaks of modernisation. Professedly anti-political, it presents modernity as a technical and meritocratic utopia. Its policy proposals bear much resemblance to those of Temer’s government, but they are delivered in neomanagerial vernacular, with emphasis on innovation, effectiveness, and rupture. If simplification and privatisation are also priorities for the new right, modernisation is a populist strategy, through which it constructs an antagonistic frontier between the political establishment and ‘good people’. In October 2016, Doria became the first person to be elected mayor of São Paulo without the need for a second round run-off. He promised a municipal government that would ‘modernise the city’, bringing it into the digital age. And he appealed both to São Paulo’s cult of the entrepreneur and to the depoliticised masses, presenting himself not as a politician but as a successful businessman, who would be an efficient manager, applying technical expertise developed during a long career in the private sector. His public administration would adopt business principles and privilege business interests. Following his inauguration as mayor, he quickly set about developing an extensive privatisation programme, which, with Trumpian conceit, he has referred to as ‘the greatest… in the history of São Paulo’. And, like Trump the realtor, Doria the marketeer became a celebrity businessman for all seasons as host of the The Apprentice. For Doria, being modern involves radical transparency. And so he recently fired São Paulo’s secretary for assistance and social development live on Facebook, with the same faux solemnity with which he previously fired contestants on The Apprentice. Modern politics is, then, a politics of spectacle, a politics of gesture. Under the leer of real-time spectators, he donates his mayoral salary to disabled children to show he is charitable; he grey-washes over the city’s famous graffiti to show that he is tough on crime; he sweeps the street in cleaner’s uniform to show he isn’t above getting stuck in; he rolls along a pavement in a wheelchair to show his concern for ‘access to the city’. And then he is back into prep-boy mufti, pastel jumper draped symmetrically around his neck – a cosmopolitan aesthete, author of Success with style: 15 strategies to win. Doria’s populist modernism is moralistic in its opposition to the ‘old politics’, and it is overtly ethical with its emphasis on probity. Its discourse is simultaneously inclusive and aspirational: Doria proposes to govern ‘for all’, insofar as anyone with determination and discipline might be struck with the luck to climb the social ladder. The good citizen, therefore, is the productive subject, who works hard and gets on; it is the public servant who loves his job so much that he is only willing to ‘strike on his days off’; it is Doria himself, the self-made man, ‘João the worker’, as presented in his mayoral campaign video. Except that, predictably, the professional trajectory of Doria, son of a politician and well-connected advertising executive, is far from self-made. The institutionalised left offers a distinct modernising vision, reflected primarily in the ‘neodevelopmentalist’ strategy tentatively pursued by the Workers’ Party government during Luiz Inácio Lula da Silva’s second presidential term and part of Dilma’s first. Lost in the political and economic chaos visited on Brazil over the last few years, neodevelopmentalism has emerged again, looking rather haggard, in the form of the Projeto Brasil Nação. Doria’s populist modernism is moralistic in its opposition to the ‘old politics’, and it is overtly ethical with its emphasis on probity. Former finance minister Luiz Carlos Bresser-Pereira has long been the most enthusiastic and articulate proponent of neodevelopmentalist ideas in the public sphere. As a modernising strategy, his neodevelopmentalism represents a third way between neoliberal orthodoxy, with its monetarist and privatising imperatives, and state-led national developmentalism, with its emphasis on industrial policy: recognition of the intransigent political and economic realities imposed following the debt crisis of the 1980s, combined with an attempt to reignite industrialisation and develop a national economic growth strategy. Bresser-Pereira has stitched together a patchwork of policies that he suggests promote a stronger market and a stronger state. Everyone wins; modernity reconciles; politics evanesces. The Projeto Brasil Nação was launched in São Paulo, on 27 April, after three months of drafting and planning, coordinated by Bresser-Pereira. Its manifesto has been signed by luminaries of the Brazilian left: musician and writer, Chico Buarque; former foreign minister, Celso Amorim; film-maker, Tata Amaral; former mayor of São Paulo, Fernando Haddad; writer, Raduan Nassar; and numerous others. 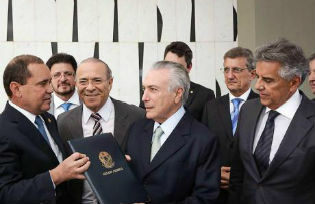 The manifesto is developmental in focus, and it is also signed by leading ‘campineiros’ (economists from the University of Campinas, a structuralist powerhouse), who, maintaining their commitment to an unreconstructed national developmentalism, have been the main critics of neodevelopmentalist concessions to orthodoxy. Nonetheless, its language and general prescriptions unmistakeably reflect Bresser-Pereira’s third way thinking. It promotes ‘economic development with price stability, financial stability, and the reduction of inequality’, as well as ‘socially responsible fiscal and exchange rate policy’. It is an attempt to occupy Brazil’s centre-ground. The launch event was hopeful, to say the least; at moments, it bordered on triumphalist. Ciro Gomes, another signatory to the manifesto and a likely presidential candidate next year, addressed the crowd with characteristic zest. The Projeto Brasil Nação, he proclaimed, has the potential to found a ‘new phase in Brazilian life’. But it is the political crisis facing the left, rather than any novelty of vision, that seems to be uniting old developmentalist rivals. And, unsurprisingly, they have converged around their common priority of macroeconomics, as the driver and primary reflection of strategy. The manifesto sets out a stultifyingly unoriginal and limited policy carte: fiscal rules that allow for counter-cyclical expansion; reduced interest rates; the maintenance of a current account surplus; increased public investment; and progressive taxation. It presents as a response to a stalled process of modernisation proposals that have been circulating for years, some of which the Workers’ Party, critical of developmentalism in its early years, adopted in government. As such, it gives the impression that the challenges the Workers’ Party faced in developing and implementing a national project were purely exogenous. As if the recession, peak unemployment, and austerity politics of recent times were entirely unrelated to neodevelopmenalism’s internal logic – its political and theoretical limitations. As if the successful implementation of a national project of development were only dependent on the rebranding of old ideas, the construction of a broader support base, and a truer and more comprehensive application of the neodevelopmentalist policy regime. And as if a national project of development were necessarily the answer to Brazil’s various, structural challenges. But there was a sense that the launch event’s applause and mutual congratulation were being contrived as a diversion from despair and self-doubt. Rehearsed conviction was followed by affirmations that this was just the beginning, as if to adjourn the inevitable question: Is this all there is? Optimism becomes a shroud for the stagnation in structuralist theory and praxis, simultaneously intensifying the dialectical tension that characterises the institutionalised left’s modernising vision. On the one hand, modernisation requires a political and ethical investment in capitalist development as a progressive process. This investment is justified as instrumental, either to a fairer form of capitalism, or to an egalitarian post-capitalist society. It is tentative: an act of faith. On the other hand, to ward off the internal voices of demurral that accompany the nurturing of faith, there is an emotional and philosophical investment in modernisation, emphasising its determinism and inexorability. Doubt itself transforms the left into the most zealous and unchanging advocate of a ‘pure’, competitive, and productive capitalism, which, if not modernity itself, is seen as but one station prior. Post-colonial intellectuals might ponder over the existence of multiple modernities but, insofar as modernity is an Enlightenment concept developed by eighteenth century philosophes, it is singular and absolute. The very possibility of multiple modern futures undermines modernity as a concept and project. Relativisation disintegrates time’s linear logic; the progressive sequence of meaningful moments is scrambled. Of course, there are always competing visions of modernity. But none can accommodate any other. And different modernising visions are inevitably formed in reference to the Enlightenment’s founding, still dominant, and resolutely Western conception of modernity as commercial, individualistic, intolerant of tradition, constructed of rational will, and morally, if not necessarily socially, egalitarian. A lasting upshot of this has been the generalisation of the idea that there is something essentially civilised about Western societies; an idea propagated even by non-Western modernisers with a reactionary, nationalistic, and anti-Western streak, such as Mustafa Kemal Atatürk, the founder of the Turkish Republic, who proposed that there is ‘only one civilisation’. With the globalisation of Europe’s capitalist inter-state system, national processes of modernisation beyond the West have been to some extent about catching up and therefore have had a certain ‘westernising’ character, even when implemented by states that aren’t predominantly capitalist in their internal organisation. Brazil has not been an exception in this regard. While economic nationalism propelled industrialisation between 1930 and 1980, reverence for belle époque art and architecture, European ideologies, and the idols of Western capitalism have all shaped Brazil’s attempted transition to modernity. The idealisation of the West continues to shape the self-image of Brazilians, particularly that of aspiring middle-classes, from the residents of Barra’s gated ‘mini-cities’ who dream of Miami-living, to the São Paulo shoppers who mourn the closure of Louis Vuitton and Christian Dior as a symbolic distancing of Rua Oscar Freire from the glamour of Fifth Avenue. ‘The Brazilian’, writer Nelson Rodrigues tells us, ‘is an inverted Narcissus, who spits on his own image’. The PT government began to shift the way many Brazilians saw themselves, with its reductions in inequality, racial quotas in universities, and projection of power abroad. Identity was then also a central concern of those who supported and orchestrated its ousting. Dilma’s impeachment and the subsequent installation of a regime whose policy agenda had been rejected by Brazilians at every election this century amount to a backlash: an attempt by Brazil’s elite to reaffirm its political authority and resignify the national colours in which it took to the streets in protest until seizing power. As it looks towards the future, Brazil confronts its colonial past. Modernisation along liberal lines is underwritten by the very oligarchs and plutocrats whose interests are protected by Brazil’s predominant colonial traditions of structural oppression, racism, and patriarchy. Once modernisation is no longer under their total control – as during the years of PT rule – the possibility of rupture with these traditions provokes in them a frenzied reaction. The media, the judiciary, industrialist federations, national corporations, foreign capital, and an alliance of deep states are mobilised in the name of order, even constitutionality. With the state recaptured, a process of managed modernisation can then recommence. Modernity’s discontents are also reflected in the spread of smouldering anti-political sentiment, particularly among the urban poor, that finds parallel elsewhere in the decaying borderlands of our globalising world. With nihilistic disdain, a generation of Brazilian neoliberal ‘modernisers’ have contributed to the erosion of traditional social bonds and the break-up of institutions that foster community and class solidarity. Resentment stirred by post-industrial class fragmentation has then been complemented by a political and moral distancing of politicians from ordinary citizens that undermines civic participation and democratic accountability. The exposure of modernisation as an elite project brings into question modernity’s egalitarian precept. An inability to connect with the emotions and everyday experiences of those left behind by modernity has had a particularly profound impact on the left, whose essential popular ties have been loosened by class fragmentation and the weakening of organised labour. The far right, with congressman Jair Bolsonaro as its figurehead, has sought to appeal to the disenfranchised through chauvinism, militarism, nativism, and promises of law and order. Evangelical movements, with their fluctuating political associations, have had most success in filling the political void, in some cases combining pre-modern ideas of revelation with a hyper-modernist narrative on self-enrichment and progress. But the left has struggled to look beyond its conventional social categories, maintain popular faith in development’s trickle-down, and construct an equivalence between the interests of different depoliticised groups. In response to a process of depoliticisation caused in part by development, the left proposes more development; in response to a crisis of modernity, more modernisation. The late literary critic Antonio Candido argued that ‘what is thought to be the human face of capitalism is what socialism ripped from it [capitalism] with blood, sweat, and tears’. But capitalism has surely ripped far more from socialism. The left is ever trapped within capitalism’s logic of conversion, naturalising some forms of oppression to fight others; capitalism produces new technologies of power at a faster rate than the left can regulate against their excesses; and power institutionalises – for Deleuze, there cannot be ‘government from the left’. The prioritisation of development, however, is a strategic choice to converge. And it is a concession to periodic crisis; indeed, ultimately, the promotion of periodic crisis. If Brazilian developmental strategies have enabled an expansion and distribution of wealth, they have also trammelled the Brazilian economy in a shrinking cycle of boom and bust. Overseen by the centralised state, development is a top-down process. Even when its trickle-down benefits are recognisable, its productivist logic imposes limitations on direct democratic participation. It necessitates ever-increasing extraction of natural resources and destruction of natural environments, and fosters cultural homogeneity. A national project with economic development as its centrepiece cannot represent the diverse interests and cultures, indeed nationalities, within Brazilian society. It can at best deliver a low intensity representative or republican democracy, in which only Brazil’s most commercially viable cultural industries survive steady westernisation. There are, undoubtedly, many on the left who recognise the contradictions in promoting development as a means to social justice. But now, with Temer just about propped up by a coalition of the right, the left appears keen to put aside differences in strategic vision. On 26 June, congresswoman Jandira Feghali focussed on the unity of the left during an impassioned intervention at the Rio de Janeiro launch of Projeto Brasil Nação, adding verve, humanity, and political grounding to an otherwise stale discussion. Other proposals to bring the left together are also being developed, such as Frente Brasil Popular’s Plano Popular de Emergência, which is broader in scope than Bresser-Pereira’s manifesto. The extent to which emphasis is placed on development, nonetheless, must surely be an ongoing source of debate. For the Brazilian right, modernity, when not simply a convenient pretext, is shorn of its progressive trappings. The left, meanwhile, remains committed to modernity’s radical promise. But drawn ever further from the realisation of this promise, the left is compelled to rethink its relationship to the modernist project. In pursuit of a singular future, the developmentalist left eschews the opportunity to be a vessel for multiple aspirations, struggles, and quests for justice, constructed through multiple perceptions and experiences. And faced with the negation of presumed truths – progress being the most obvious – its response is limited to a hubristic reaffirmation of their continued validity. No less than the materialist right, the materialist left imagines straight lines where there are angles, forks, and dead ends. As Brazilian politics increasingly escapes rational explanation, both find themselves lost in history’s labyrinth.